Where will the Workers Live? This "Historically Speaking" column was published in the Exeter News-Letter on Friday, July 31, 2015. What defines a neighborhood? Sometimes we know our neighbors well. We may have children who go to school together or we may work near one another. There may be only a passing familiarity – the tall man with the little dog, the basketball boys dribbling on their way to the playground each afternoon, the woman who always backs her car into the driveway. We get to know each other for a variety of reasons. When asked, my daughter once defined her neighborhood as “all the houses you can trick or treat” on Halloween. In modern times, neighborhoods, although still defined by income levels, have less to do with local industry than they once did. People of an earlier age tended to live close to their employment. In tracing the history of a neighborhood it’s best to look at the growth of the town from an economic viewpoint. Most New England towns began as farming communities with small central commercial areas. Exeter is no exception to this rule – the businesses and tradesmen clustered near the river. Goods could be shipped in and out of town easily. Merchants lived near their businesses in the center of town and everyone else lived farther out. This all changed with the arrival of the Industrial Revolution in the early nineteenth century. Towns such as Exeter and Newmarket, which both had early cotton mills, found that housing was needed for the workforce. In some New England towns, a boarding house system was created. Lowell and Lawrence, Massachusetts, hired teenage farm girls to work in their mills, counting on them to have a solid work ethic, honed on years of chores. The operative’s lives were carefully controlled to ensure that their morals weren’t being compromised. Hours were long, freedom was limited. In smaller communities, such as Exeter and Newmarket, the system didn’t work well. There were no formal boarding houses with strict rules. The towns were simply too small to support that level of company owned and controlled housing. Young women who arrived in town to work boarded with local families and many soon left factory work to marry or return home. The Exeter Manufacturing Company soon turned to a different source of labor – immigrant families. People arrived in New Hampshire from Ireland and Quebec in the 1850s. The mill wasn’t terribly interested in the type of housing people found as long as they could arrive at work on time. 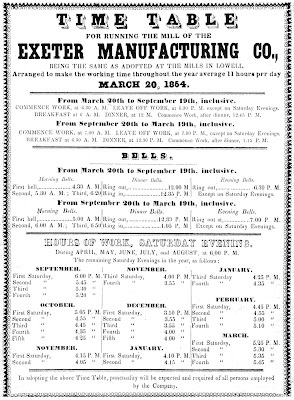 To keep the workers on schedule, the mill kept a bell schedule that reminded people when to get up and when to arrive at work. Like the bell system many of us lived by in school, there was a warning bell and a final bell. In 1854, the first bell of the day rang out at 4:30 in summer and 5:00 in winter. A second bell rang an hour later and a third bell ten minutes before work commenced for the day. 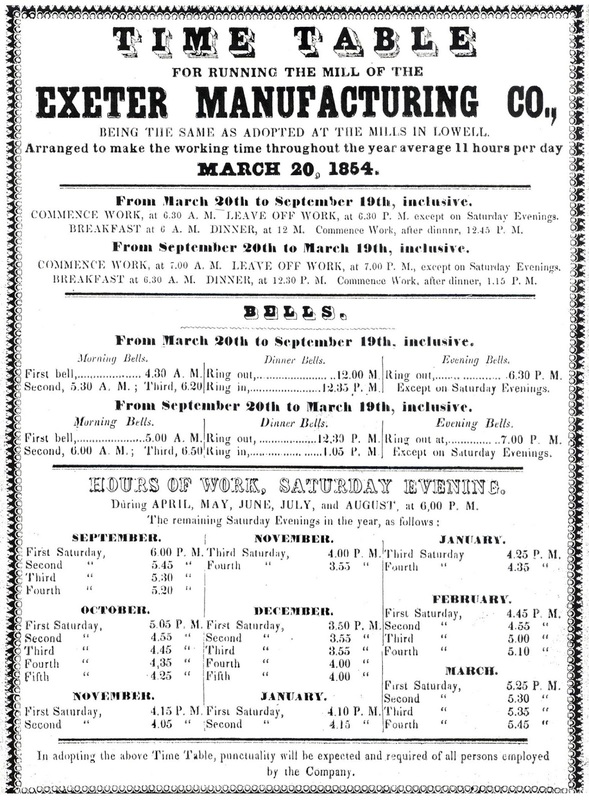 Obviously, workers had to live close enough to the mill to hear the bell and the schedule seems to have given them ten minutes to get to work. “In adopting the above Time Table, punctuality will be expected and required of all persons employed by the Company” read the notice. This time table was, “arranged to make the working time throughout the year average 11 hours per day,” it further informed. Workers were allowed a 45 minute lunch break. Most went home. This system remained essentially the same for decades. Workers walked to work and lived near the mill or factory. In this way, distinct employment-based neighborhoods could be seen in town. In Exeter, cotton workers lived by the river in tenement buildings on Pleasant, Franklin and South Streets. A few families lived on Jady Hill, High Street or the Prospect and Highland Street areas. But aside from very few out-layers, by 1911 when the shoe factories had popped up by the railroad, most textile workers lived in downtown river neighborhoods. Up by the tracks, near Gale Brothers and Bates shoe factories, there were more factory neighborhoods. The 1911 town directory lists more people working at Gale Brothers than at any other place of employment. 326 people listed Gale Brothers as their employer that year. Exeter Manufacturing Company – the cotton mill – had 147 operatives identified in the directory. Bates Shoe had a mere 37 workers, but like the Gale Brothers employees, they lived in the west end of town. These little working class neighborhoods have a charm all their own. The relationships were tight; ethnic groups melded together as Irish, German, Polish and French families intermarried. It’s enough to make us ponder what holds our neighborhoods together today? We certainly don’t have to work within 10 walking minutes of our jobs. Newer neighborhoods still have a shiny exciting pioneer feel to them that binds the residents together. They get the thrill of watching the trees grow and the lawns fill in. Older neighborhoods have their own charm and moving into one feels more like gaining an inheritance. Uncovering the lives of the former residents tells a long story. Thank GOD we have a place to live here in Exeter since the C0-ops were established. As always, your column is excellent!! Thank you for your dedication to keeping the seacoast community connected to its history. When Did Playgrounds Become a Thing?